Are you suffering with a toenail that is digging or cutting into the skin of your toe? Then this is an ingrown toenail, also called by doctors’ onychocryptosis. 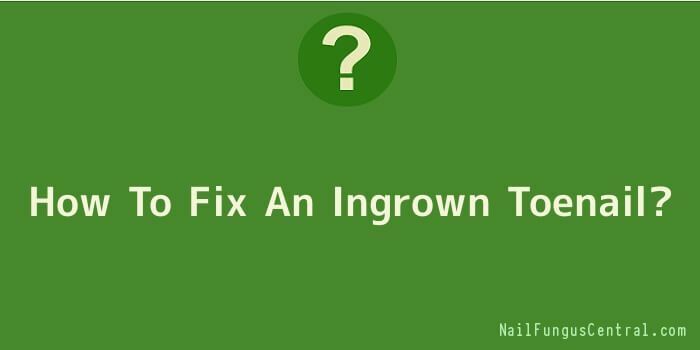 If you want to know how to fix an ingrown toenail you have come to the right place. This is a problem many people have to deal with today and it most commonly affects the big toe, though it can happen on any of the others. This article tells you a quick and easy way on how to fix an ingrown toenail if it is not infected, how to recognize of it is infected, and what to do then. Why you? In case you are wondering why you have developed an ingrown toenail; here are some of the reasons it happens. Firstly, if you have more rounded nails then this can make you more likely to get it, if people in your family get them this makes you more likely too as well because there is a genetic tendency. You may have recently injured or damaged your toe and trauma can cause it to happen. If you have a toenail infection this can cause the shape of the nail to distort leading it to grow into the skin. Tight shoes and high heels are also a causing factor. But probably the most common cause of ingrown toenails is cutting the nails incorrectly! Too many people cut the nails too short and round them like fingernails. In fact you should let them be a little longer than the toe and just cut straight across. 1. Soak the foot in warm water with or without added salts at least 2 or 3 times a day. 2. Dry them thoroughly after each soaking. 3. Use a mild antiseptic on the area and bandage the toe. 1. Soak your feet in an Epsom salt bath a couple of times a day. 2. Dry your feet thoroughly then carefully lift the nail as far as you can and insert a rolled up small piece of cotton ball under the nail. Though painful it will help the nail grow correctly. Do after a foot soak and it will be easier as the nail is softer. 3. Some people soak the cotton roll in tea tree oil first as it has antiseptic, anti-microbial and anti-fungal properties to help the healing and prevent infection. 4. Change the cotton roll every day and repeat for several days until the ingrown toenail is successfully treated. If there is infection you need to visit a doctor or podiatrist (foot doctor). There is a very simple and quick surgical procedure they can perform there in the office to remove part or the entire nail, they can drain the infection and prescribe antibiotics if they are needed. The procedure itself is painless, as an anaesthetic is used to numb the toe. After the surgery you will need to soak your foot daily, stay of it for one or two days, apply an ointment and clean bandages and keep it clean and dry. Pain is managed usually just with ibuprofen or acetaminophen though your doctor may prescribe something.